There are a lot of Orient Express Pro Street bikes sprinkled all around the US and Caribbean islands that can’t make the trip to Maryland International Raceway for every Mickey Thompson MIROCK Superbike Series event. But when MIR promoter Jason Miller puts on the $10,000-to-win Battle Royale, every Pro Street bike in the Western Hemisphere trailers up and heads for the famously prepped strip in Budd’s Creek. When MIR promoter Jason Miller puts on the $10,000-to-win Battle Royale, every Pro Street bike in the Western Hemisphere trailers up and heads for the famously prepped strip in Budd’s Creek. Many of these guys are kings of their own quarter mile castles—in the Midwest, Southeast, Northwest—wherever. The Battle Royale is their motivation to take on the best of the world’s largest motorcycle drag racing series. That would include the currently dominant DME Racing team and their four-bike stable of turbocharged Suzuki Hayabusas, and HTP Performance’s “First in the 6’s” trailer-load of nitrous and turbo ‘Busas. All will get their chance to take shots at MIROCK champion Joey Gladstone and his 220 mph DME bike, inaugural Battle Royale winner Terence Angela of Aruba, NHDRO champion Doug Gall, 3X MIROCK champion Rodney Williford, and HTP riders Ryan Schnitz, Danny Cox, and (sometimes) Jeremy Teasley. And all will be shooting for the sport’s first 6.80 street tire pass. Challengers include Detroit’s Ronnie Mitchell Racing trailer of beautiful bikes Rizzo, Frenchy and Sandra Dee with riders Phil Stoll, Jason Angela and Michael Bayes; The innovative bike of Michigan’s Bud Yoder and the fluorescent machines of John Drake; And builder Eric Paquette will bring his brand new DAS turbo ‘Busa for last year’s runner-up Tony Ficher to ride. As MIR aims for 50 Pro Street entries, these racers are also confirmed so far: Darion “Nanu” Payne, Curtis Ellerbe, Eric Hart, Ryan Hable, Frankie Stotz, Vinnie Demito, John Gover, Walter Sprout, Al Mart, Caleb Holt, Richard Gadson, Eric Langlois, Jason Rearick, Jamie Lopes, Mike “Kavos” Kovacevich, Lonnie Corley, Tyler Fisher, Cameron and James “Crow” Teasley, Gabe Frederick, Jason Dunigan, Doug Witt, Super Dave Gebhardt, Stephen Scearce, Quinn Orand, James Herbert, Ehren Litten, Travis Wood, Joe Robbins, Chris Hart, Rendolf Torbed, Lavar Delee, and Rob Budgell. These riders hail from Maryland, North Carolina, New Jersey, Wisconsin, Michigan, Illinois, Pennsylvania, Florida, Iowa, Massachusetts, Texas, St. Eustatuis, Aruba, Ohio, Missouri, Delaware, Virginia, Indiana, Tennessee, Minnesota, and Curacao, as virtually every turbo or nitrous ‘Busa, GS1100, Kawasaki ZX14, and Honda between the Atlantic and Pacific will be competing at MIR. 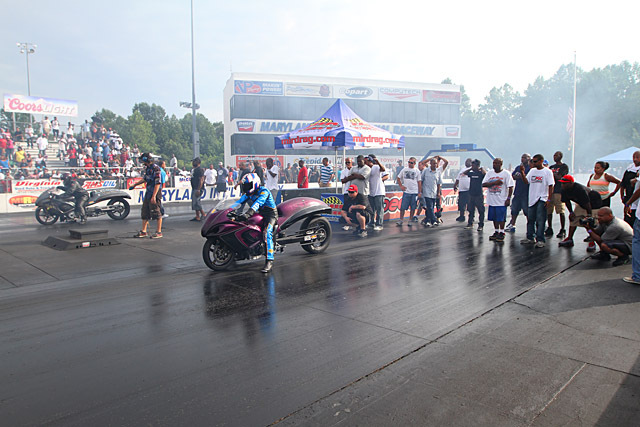 The Battle Royale may steal some thunder from what has been the most wide-open DME Racing Real Street season in memory. 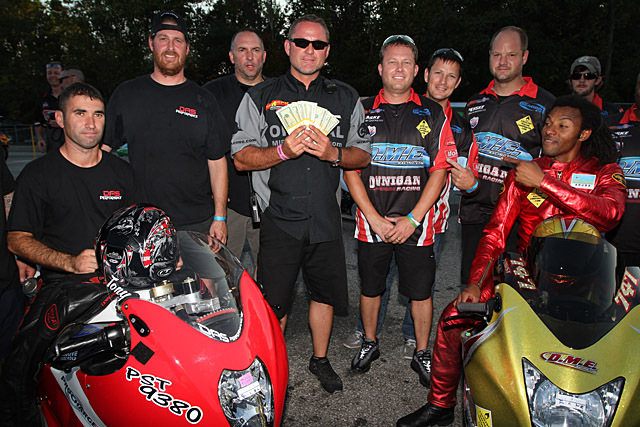 Rickey Gadson, David Merks, Johnny “Turbo” Dobrin and Jeremy Teasley have all been winners this year, and inaugural Crazy 8s champion Eddie “Who” Chapman has come damn close. Turbo Kawasaki ZX14Rs, nitrous-huffing ZX14s, turbo ‘Busas, nitrous ‘Busas, GSXR1000s—this class has everything and everybody puts everything they have into winning it. One class whose thunder can’t be stolen is the thunder and lightning of Top Fuel motorcycles. 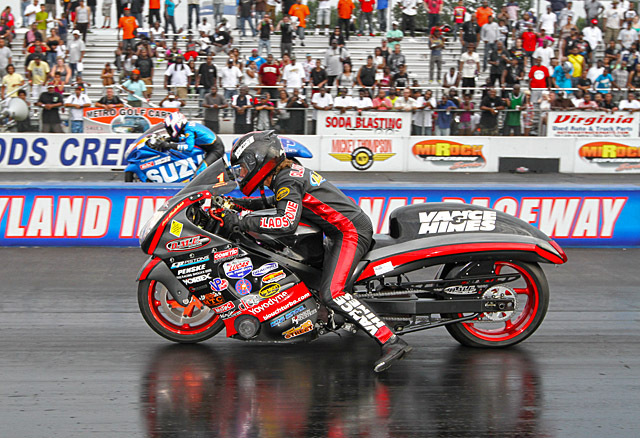 The world’s first ever side-by-side, 5 second motorcycle pass took place at Maryland International Raceway in July. Larry “Spiderman” McBride and David Vantine will be back to spark that magic again with four exhibition passes to get the job done. The two are tied, with multi-time champion McBride taking the overall win in July and nitro-newcomer Vantine doing the deed at Atco. This will be the rubber match to determine who is MIROCK’s first Top Fuel exhibition champion, and will likely see a new world record as McBride fully intends to put the first-ever 5.60 pass on MIR’s scoreboards. Larry “Spiderman” McBride and David Vantine will be back to spark that magic again with four exhibition passes to get the job done. The two are tied, with multi-time champion McBride taking the overall win in July and nitro-newcomer Vantine doing the deed at Atco. With two events left in the season, Sportsman point races are as tight as they can get. With three Louis Concrete 4.60 runner-ups but no wins, Eran Pielert leads Ronnie Smith by 20 scant points. Atco winner Bobby Lovingood is making a charge from third and Darryl Hollins is one point behind him as the world’s quickest motorcycle index class takes to the eighth mile. A determined Michael Ostrowski has a sizable FBR Shop 5.60 points lead over the hardest working man in motorcycle drag racing, Ben Knight. But Ron Arnold, Robert Parker and “Fearsome” Andy Baumbach will also be fighting for the win at MIR. Brian Canoles leads Boo Brown in the Trac King Clutches Top Sportsman points, with George Shriver, Bill Bair, Connecticut HVAC man Bob Carlson, and Jimmy “Hillbilly Hustler” lurking just behind. 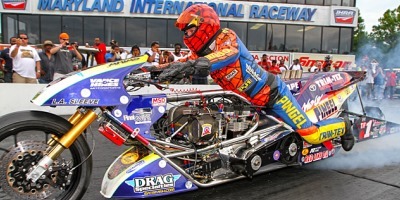 Brock’s Performance Street ET and Fast by Gast Pro ET can expect to see their biggest fields ever as everybody without a win yet this year fights for a spot in November’s Tournament of Champions to race those who already have. Studs such as Brian “$5K” Guarino, Dale Hamilton, Mike Schulz, Clay Davies, Boo Brown, Ron Arnold, Jerry Turner and Dustin Lee will be defending to keep the TOC field from swelling further. Afterdark Undergound will see riders Lil’ Richard, Nanu, Jeremy Teasley, Lil’ Charlie DeLee and more out hustling on bikes Katrina, N2Deep, Mandingo, Cobra Kai and the like. Motor-mouths Chachi, Alex Bud Light and Country will be whipping the crowd into a big-dollar frenzy. Speaking of studs, Afterdark Undergound will see riders Lil’ Richard, Nanu, Jeremy Teasley, Lil’ Charlie DeLee and more out hustling on bikes Katrina, N2Deep, Mandingo, Cobra Kai and the like. Motor-mouths Chachi, Alex Bud Light and Country will be whipping the crowd into a big-dollar frenzy. The cooler weather will have everyone celebrating this final stop at MIR on the MIROCK tour. Grills will be grillin’ cans will be poppin’ stereos will be blastin’. But let’s not forget why we will be there. Everyone who let the Battle Royale slip away last year have been gnashing their teeth ever since and will leave nothing on the table in pursuit of $10K and 6.80 glory. You will want to be in that number for the second running of this historic event.